Simply a Woman of FaithIf you’ve been struggling to figure out the meaning of it all, dealing with relationship, financial or health issues, then you know what it’s like to carry burdens that sometimes seem too heavy. Even if things are going well on the surface, maybe there’s an underlying need for more. More guidance to a truer path, more divine wisdom in your daily life, more of a sense of inner peace and harmony in the little things that happen to you moment by moment. It’s important for you as a woman to know that there is a plan, that the things you do are leading you toward something bigger, something beyond the here and now. There are forces at work that transcend words, actions and emotions. It’s these divine influences that, regardless of denomination, can be an instrument of real change in your life. That’s the message found in Simply a Woman of Faith. The book follows the personal story of the author, Spiritual Coach Pat Hastings, as she continues to seek to live the life she imagines, fulfilling her dreams and following God’s Divine Plan. While she is escorted through a journey to find meaning and peace, she faces near bankruptcy, the loss of her home and business and at one very critical point, the near loss of her faith in God. Yet, she manages to overcome her fears and doubts by putting her trust in God and His ability to provide her with signs to guide her. Through her writing, she helps the reader find meaning in everyday life through prayer, dreams and angelic forces. Simply a Woman of Faith should be on every woman’s nightstand as a reminder that there is something bigger at work. It’s a practical guide with step by step suggestions and even spaces right in the book for spiritual reflection and journal-writing. You’ll find it hard to put this book down, but will be eager to pick it up again and again as you start to recognize serendipitous moments in your day to day activities. You’ll begin to look at things differently, finding meaning in things that seemed just matter-of-fact before. 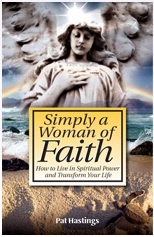 When you begin to take the advice and heed the wisdom in the pages of Simply a Woman of Faith, you’ll start to feel lighter, as if a weight starts to lift from your shoulders. This is the weight of the material world being carried for you by God, as you put more trust in His ability to step in and guide you like never before. Throughout the course of our lives, we are destined to encounter various challenges that darken our days and threaten to disrupt our peace of mind. No matter what adversity may come, though, it’s important to remember that a benign spiritual force is always at work behind the scenes, orchestrating every step of our lives in an effort to help us fulfill our true divine purpose. Such is the central message of memoir by author Pat Hastings. Rife with invaluable life lessons, Hastings’ inspiring new offering takes the reader on a compelling journey through the grievous lows and joyful highs of her eventful sojourn, through life, highlighting the myriad difficulties that she’s faced along the way. Despite having suffered a series of grueling losses, Hastings never abandoned her faith – and the richly rewarding life she now lives is a direct result of her unyielding determination. As such, her powerful life story serves as an uplifting guide for anyone currently struggling to hold out the hope that things will eventually get better; if nothing, else, Hastings is a shining example of the blessings that await us all if we simply learn to persevere through the darkest of times. A highly recommended read.